ALICE FEST – Films By Women. For Everyone. Thanks to everyone who came out to ALICE FEST 2014 today! Links to information from the festival will appear under the Blog tab later this week. Stay tuned for more ALICE FEST sponsored events coming up later this year. Full Frame Theater on the Historic American Tobacco Campus, Durham, NC. March 9, 2014. DON’T FORGET! Spring Forward Time – Set your clocks ahead ONE HOUR before you go to bed on Saturday night so you will be on time on Sunday, March 9, 2014. You don’t want to miss a minute of 2014 ALICE FEST! Listen to THE STATE OF THINGS on WUNC Radio on Wednesday, March 5th at noon, to hear Vivian Bowman-Edwards, festival director along with filmmakers Carol Bash and Camden Watts, talk about this year’s ALICE FEST. If you miss it, go to wunc.org/programs/state-things to hear the recorded broadcast. THE THIRD ANNUAL ALICE FEST IS SUNDAY, MARCH 9, 2014. Set your clocks ahead one hour before you go to bed on Saturday, March 8th so you won’t miss a minute of the festival! THE 2014 FILM LINE-UP FOR SHORTS AND WORKS-IN-PROGRESS ANNOUNCED. 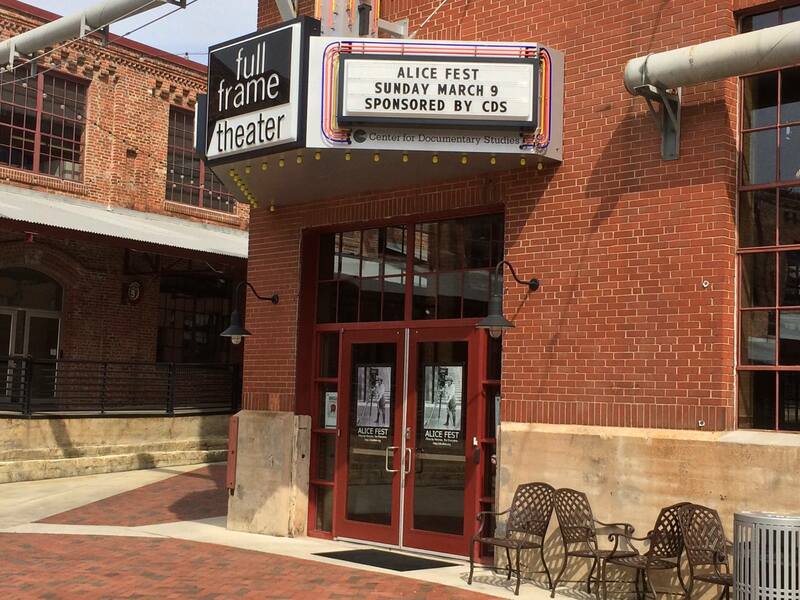 The third annual ALICE FEST is March 9, 2014 at the Full Frame Theater (new location) in downtown Durham, NC, in the historic American Tobacco District, 320 Blackwell Street. Doors open at 1:00 p.m. with refreshments. Screenings begin at 1:30 p.m.
ALICE FEST is a film festival presented each year in March in recognition of Women’s History Month. The festival showcases curated and submitted work by women with a special emphasis on women’s history and achievements. ALICE FEST features short documentary films, experimental films, animation, multimedia projects and documentary works-in-progress.